Semyon Yulianovich Sidorchuk (sort. On September 1, 1882 in Russia, in the city of Kobrin of the Grodno province, mind. in the spring of 1932 in Poland) — the Russian architect. Was born in a family of the corporal, employee of the Minsk railway gendarme police department of. Lida Vilenskaya of the province of Yulian Gerasimovich Sidorchuk and peasant Maria Kachankova. In 1900 Semyon Sidorchuk graduated from Vilensky real school, and in 1907 - Institute of civil engineers. During study in school there his fellow countryman, the archpriest Ioann Kotovich whose son architect Nikolay Kotovich also graduated from the Institute of civil engineers in St. Petersburg was a religious teacher. It is possible, to assume that the vilensky archpriest patronized the young fellow countryman. Perhaps, Yulian Sidorchuk is from Cherevachitsky arrival where uniatsky and orthodox priests of Kotovichi - the father Ioann's ancestors served. It is probable that the fashionable St. Petersburg architect Nikolay Kotovich who had communications in the high society helped the young graduate of institute to settle to the prestigious place - Tsarskoye Selo palace management. On April 30, 1908 Semyon Sidorchuk married the noblewoman Olga Konstantinovna Pisareva (1889-1978), the daughter Irina who gave rise to him in seven months on December 1 (according to documents of the Brest archive), he after whom her mother will name for some reason Svetlana. In general family life of the architect is worthy the Hollywood melodrama. Let's tell about it in brief on the basis of article A.Yu. Doroshenko "Olga Konstantinovna Gorinevskaya". Mother of the wife of the architect Varvara Nikolaevna was fizgig, constantly changed the husband Konstantin Ivanovich Pisarev and did not even hide that her lover Evgeny Genrikhovich Meyen was Olga's father. The beauty of Olenyok was a girl emotional and too a little thoughtless, but talented. It graduated from the St. Petersburg conservatory on a violin class at famous professor Leopold Auer. On a charitable masquerade which sisters Pisarev in the St. Petersburg apartment arranged Olga got acquainted with the student architect Semyon Sidorchuk. 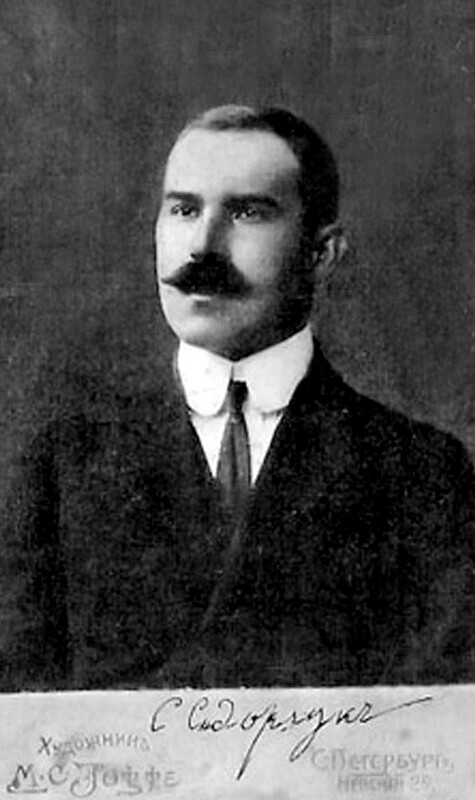 Her close girlfriend, the famous writer Margarita Vladimirovna Yamshchikova (pseudonym "Alexander Altayev") left a literary portrait of Semyon Sidorchuk: "... roughly hammered together, vulgar and boastful and pompous, with small cold eyes, the lower jaw which is given forward and the reddish-black sticking-out moustaches". This assessment of one of parties of the conflict, of course, is subjective and prejudiced. As Yamshchikova noted, Olga of the student did not love. "Among the family and acquaintances there is she for fun and a little scornfully called his "godmothers firefighter"". However the pregnant girl needed to marry urgently. Olga and her girlfriends that Sidorchuk promised to marry the girl carrying perhaps, and not his child put a lot of effort. "Over time Semyon Sidorchuk received the place of the imperial architect and moved with a family to Tsarskoye Selo, - to "The pink pavilion" on an imperial farm, and even started the departure. They say that the tsar Nicholas II called it "my Semyon" and even charged construction of a chapel on Grigory Rasputin's grave". Such imposed marriage, of course, could not be happy." Court, brilliant life in Tsarskoye Selo began to whirl the head to the young woman. Day of "madam of an imperial arkhitektorsha" began with visit of the hairdresser. The violin, reading, self-education were left. Semyon Sidorchuk played a role of "important mister" before old acquaintances and Tsarskoye Selo servants though, to tell the truth, the highest nobility did not award his acquaintance on "a short leg". There passed a little time, and life in Tsarskoye Selo began to weigh Olga Konstantinovna. - Idle, not warmed by any warm heat, life "for show" always was, according to her, flour". On the eve of World War I Olga Sidorchuk went to be treated to Switzerland where she has love affairs romance with the German professor of biology and chemistry Friedrich Quade. On March 20, 1915 their daughter Ksenia was born in Tsarskoye Selo. Olga did not hide from the husband that it is not his child, but the architect, likely, strongly loved the wife, and wrote down foreign child as the daughter. Then military wanderings of Semyon Sidorchuk began. And the wife with daughters left hungry Petrograd in the manor the Ravine in the Gdovsky County. There on a summer season still the writer Margarita Yamshchikova which in 1926 she bought removed a wing from pre-revolutionary times at it. In 1920 Semyon Sidorchuk managed to return to native Polesia which appeared in borders of the revived Poland. He called the wife with daughters to himself, but that refused. Life forced it to build a new family. On May 13, 1927 Semyon Sidorchuk got married in the Simeonovsky cathedral in Brest 28-year-old Faina Georgiyevna Montvilitskaya (the first wife called her the canary of a nightspot). It is interesting that the engineer Georgy Aleksandrovich Maymeskul witnessed. He and the engineer Nikolay Ivanovich Kotovich were heads of the Russian monarchic organization in the Polesia voivodeship. A twist of fate - Nikolay Kotovich became the Brest city architect instead of Sidorchuk. Engineers Maymeskul and Kotovich supported illegal communications with the general Alexander Kutepov and the grand duke Nikolay Nikolaevich. It is thought how the imperial architect, Semyon Sidorchuk had monarchic views, but from archival documents it is visible that he did not take active part in the anti-Bolshevist movement. Let's note that Boris Maymeskul, the brother of Georgy, was also famous Brest monarchist, he in 1928 lodged in Lutsk where he opened lawyer office. It is thought that Boris Maymeskul drew the architect to Volhynia and helped him with employment. And the first wife Olga Konstantinovna then married the cousin Dmitry Vladislavovich Gorinevsky. In the conditions of poverty it had to work as the teacher of initial classes at rural school." Sidorchuk (it is necessary to pay it tribute) showed fatherly feelings. In due time it sent to Olga Konstantinovna money for Svetlana's keeping (but not Ksenia), - and it was essential financial support. Olga Konstantinovna who did not have an opportunity to give to the daughter worthy education sometimes could not even support her. It was forced to release Svetlana to the father" . The architect's daughter Irina (Svetlana) graduated from Academy of Arts in Warsaw and became the artist. Soon she married the economist Dolsky. It is possible to assume that before a wedding the bride passed into Catholicism and Irena accepted a name. After World War II Dolsky' family moved to New York where Irina (Svetlana) became the quite famous artist. Ksenia Sidorchuk, thanking also to Yamshchikova's efforts, left to Germany to the father Friedrich Quade. After war it also it appeared in America where her husband Vladimir Filippov worked as professor of chemistry at university in the town of Kranford (State of New Jersey). Olga Konstantinovna Gorinevskaya left in 1967 to the daughters in the USA where lived to the death in 1978 in the house of the younger daughter. And the Ravine she bequeathed the two-storeyed farmstead house in a manor to the state for creation in it the memorial museum of the outstanding Russian of the writer and the memoirist Margarita Yamshchikova (1872-1959). Let's hope that there will be a memory and of the talented architect Semyona Sidorchuk: streets in the settlement of Domachevo, in native Kobrin and in Brest which it restored from ruins will call by his name. Unfortunately, there is no street of the engineer Sidorchuk in Domachevo any more: of it got rid, as of heritage Polish occupations. 1) Construction on own project of a shooting range for leyb-guard of Hussars (the empire pavilion, reinforced concrete designs, cost is 100000 gold rubles). 2) Creation of the project and construction of the military museum in Tsarskoye Selo (the reinforced concrete arches, a central heating, cost are 360000 gold rubles). 3) Church on a military cemetery. 4) Operational management and development (within 5 years) the sewerage of Tsarskoye Selo which had station of biological clarification of drains of the whole city (33000 inhabitants). 5) Projects of expansion of palace (city) hospital and performance of expansion of sanatorium for tubercular children in Tsarskoye Selo. 6) Shooting and the plan of alignment of park in Tsarskoye Selo (800 hectares). 7) Construction of several private country houses. 8) Design and a construction of roads and bridges in the Tsarskoye Selo county (1911-1913). 9) Design and construction of army barracks and radiotelegraphic station. 10) Design and construction of hospital and school buildings in C. - the rural county for a zemstvo (district meeting). 11) Construction and the equipment of military hospitals and the Red Cross during war. 12) Construction of bank and mail at Voyeykovo's station. 1) Project of povshekhny school [free, general school. - A bus] on Krivoy Street [now Dzerzhinsky] 20 school rooms. 2) The project of a rasplanirovka of "The new area" together with the official town. 3) Project of regulation of the suburb "Shpanovichi". 4) The project and construction of malls on Yagellonskaya Street [now Masherova]. 5) The project of a myasoboyna on Shpitalnoy Street [now International]. 6) Project and execution of the main collector. 7) Project and construction of "Talmud-Tory" (tryokhet. it is handed over.). 8) The project and construction of summer theater in park "on May 3". 9) Projects of 2-year movie theaters. 10) Project of technical railway school. 11) Project and construction of the house of the item [Ana] of the King. 12) Project and construction of the house of the item of Skorbnik. 13) Project and construction of the house of the item of Maymeskul. 15) The project and construction of land department and are a lot of other private structures. 16) The official town in Kobrin. 18) City power plant in Kobrin. 19) Seven-cool povshekhny school in Zhabinke. 20) Road management in Longyingqie. 21) The regulation of the town of Domachevo executed on the place, and one of streets it is called by the name inzh. S. Sidorchuka. 1. Gistarychnaya Bramah No. 1 (26) 2011.